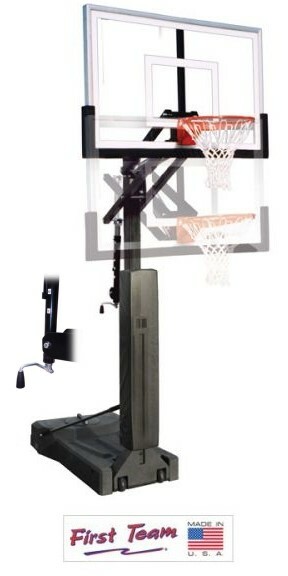 The OmniJam portable basketball goal brings gymnasium quality style and performance to any home court, primary school or recreation facility. The OmniJam outperforms any portable in its price category. The units high durability, stability and performance are built in to the units design. First Team is proud to manufacture its products in the USA, and this commitment shows in the OmniJam. The large poly base has a 500 lbs. sand capacity. The base unit has a large plug on the back for easy ballast (sand) loading during assembly. The unit has a durable 4" square one-piece post that will not separate or wobble like common sectional posts. The crank handle on the back of the post makes rim height adjustment easy for any age. By turning the hand crank, the rim height can easily be adjusted infinitely between 10 and 7. An easy to read height regulator is located on the back. Transport is also simple. The large cam lever handle design makes moving the unit over any hard, smooth surface a breeze. Pull handle forward to roll, lift handle for play. Various backboard sizes and materials are available to choose from. For added safety, a contoured post pad is also available in an array of colors. To really dress up your home court, choose First Teams post pad custom lettering option. Because it comes from First Team, you know its 100% Made In the USA and that means quality. When you are looking for a portable basketball hoop to fit your performance demands that wont break your budget, choose First Teams affordable portable, OmniJam!